In San Casciano Val di Pesa, in a high, panoramic position on the hills in the province of Florence, there is this ancient castle dating back to the 12th century for sale. This noble estate is currently a private home and an enchanting example of an architecture presenting a mix of Renaissance elements with rigid Medieval structures, framed by a green area surrounded by cypresses. In the 16th century, the Buondelmonti family converted the original fortress into a Renaissance villa. After being owned by this area's most influential noble families, such as the Corsini, this magnificent historical estate is currently in a perfect state of care and stands in all its timeless glory. This villa measures approximately 2,000 m2 overall and features very spacious rooms adorned with ceilings that have either exposed wooden beams or vaults, and refined cotto-tiled floors. There are twelve bedrooms, twelve bathrooms, big state halls with fireplaces and period furniture. This estate is surrounded by approximately four hectares of grounds. The beauty of this magnificent castle for sale In the Tuscan countryside blends with the most modern comforts this great estate has to offer, together with its extraordinary view of surrounding valleys and Tuscan hills. 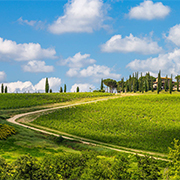 It is here that you will find ancient and prestigious castles, historical villas, exclusive period estates, and luxury properties which make these beautiful landscapes even more special; you will also find wonderful, historical farmhouses that are a symbol of the Tuscan countryside's long, florid history. 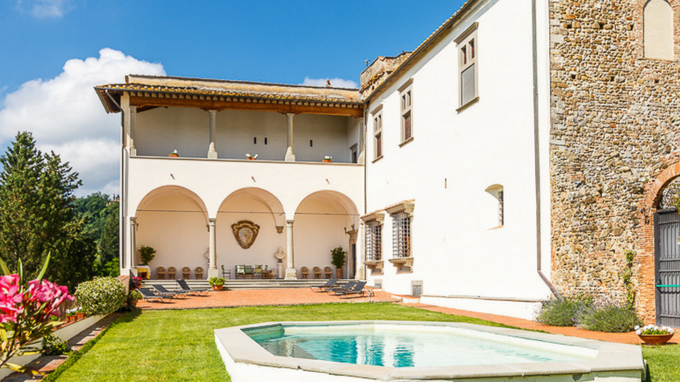 A few steps away from the beautiful city of Florence, the cradle of the Renaissance, this charming 16th-century historical villa is for sale. This villa for sale is on Fiesole's enchanting hills, one of the most exclusive and panoramic areas of the province of Florence. Overlooking the clear blue sea of ​​the Island of Elba, set in a lush park, this luxury villa is for sale.